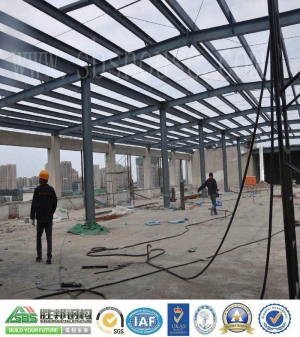 Steel structure rust removal methods are: manual processing, mechanical processing, chemical treatment and flame treatment of four.Therefore, metal building contractors generally cooperate with the best steel warehouse manufacturers. Mainly with the shovel, steel wire brush, emery cloth, broken steel blade tools such as manual processing method by hand knock, shovel, scraping and brushing, sand to remove rust, the rust removing method painter tradition, method is the most simple, no environment and construction conditions, but due to the efficiency and the effect is too poor, can only apply to small range of rust. The mechanism of mechanical rust removal is mainly to use some electric and pneumatic tools to achieve the purpose of removing rust. Electric tools, such as electric brushes and electric grinding wheels, are commonly used as electric tools, such as wind brushes. The electric brush and the brush is rotated by a special pneumatic circular wire brush, by the impact and friction to clean and remove rust or oxidation skin, especially for surface rust, the effect is good, but it is difficult to remove deep rust. Is the actual electric wheel grinders, can move freely in the hands of the high speed rotation using a grinding wheel to remove the rust, the effect is good, especially for deep rust, the working efficiency is high, the construction quality is good, easy to use, is an ideal cleaning tool. But in the operation must be paid attention to, do not wear the metal skin. Sandblasting, shot peening method is the use of a small amount of manual welding gun is difficult to remove deep rust spots, burning red, let the high temperature rust oxide change chemical composition and achieve the purpose of rust removing. The use of this method should be paid attention to not to burn the surface of the metal, and to prevent the large surface of the surface from heat deformation. The method of chemical treatment is actually acid cleaning and rust removal. The chemical reaction of acid solution and metal oxide (rust) is used to produce salt and out of the metal surface. The commonly used acid solutions are sulfuric acid, hydrochloric acid, nitric acid and phosphoric acid. The acid solution is applied to the metal rust part to remove the chemical reaction from the rust. After removing rust, rinse with clear water and neutralize the reaction with weak alkali solution, then dry and dry after rinsing with clear water in order to prevent quickly rusting.